The John Deere High-Performance Gator RSX860i has the performance and handling to treat tight off-road turns on back country trails, or around the ranch, as if they are nothing at all, with power and speed to match. Dynamic photography, gritty type and bold messaging get the message across this is not a vehicle for the faint of heart! 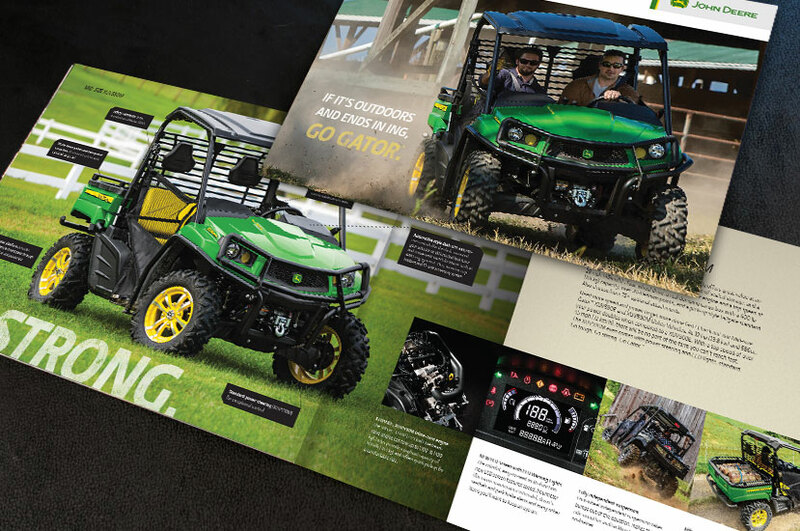 This brochure features clean typography and page design to highlight the features of this high-powered utility vehicle, allowing consumers to identify things like cargo capacity, safety features and price. By using quality photography that shows the vehicle both in use and in diagrams, the brochure portrays the product as highly attractive to potential buyers.